This past weekend TK team members got a chance to partake in Scotiabank Hockey Day in Canada festivities. The kickoff event happened up at Sun Peaks Resort on Wednesday night. It was a picturesque scene, as the band played the Stanley Cup was skied down from the top of Sun Peaks to the bottom via ski patrol and lighted torches. It was a beautiful sight, as it was snowing like crazy and the energy in the crowd was electric! The snowy cup was then carried up on the stage for opening comments led by Ron McLean. Many hockey legends were in attendance as the snow flied, such as: Lanny Macdonald, Trevor Linden, Cory Cross, Cassie Campbell-Pascal, Wade Redden and Hockey Hall of Fame member, Bryan Trottier. Sun Peaks anticipated that 200-300 people would come for the opening ceremonies but attendance numbers exceed over 1000. A great start to such a fun weekend! Following the opening ceremonies TK attended the celebrity luncheon hosted at the TCC. 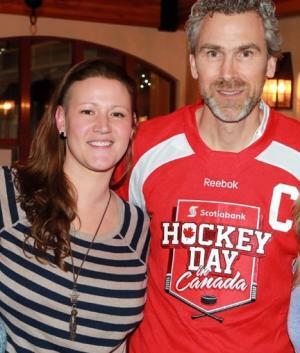 We had the pleasure of sitting with NHL alumni, Wade Redden. Redden played a total of 1,023 games with four different NHL teams: the Ottawa Senators, New York Rangers, St. Louis Blues and Boston Bruins. He amassed career totals of 109 goals, 348 assists and 457 points in the regular season, while appearing in 106 career playoff games, recording 49 points. Redden had a career plus-minus of +160 and he played in one All-Star Game (2002). Throughout lunch we were entertained with the semantics of the popular, “Coaches Corner” with Ron McLean and Don Cherry. 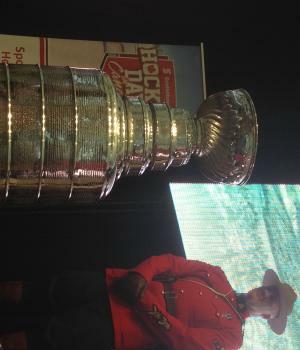 The Stanley Cup was escorted in via RCMP Mounted Police and over 1200 people singing “good old hockey game”. Later that night team “Tucker”and team "Recchi" faced off against each other for an action-packed game which the crowd loved! If you looked around jerseys could be seen from all types of eras and teams. It really was one of the best family friendly events Kamloops has seen this year.Little kids faces were lit up with excitement almost as much as their parents, who got to see their childhood heroes play together in Kamloops! Lanny Macdonald was a fan favorite as well as Trevor Linden. 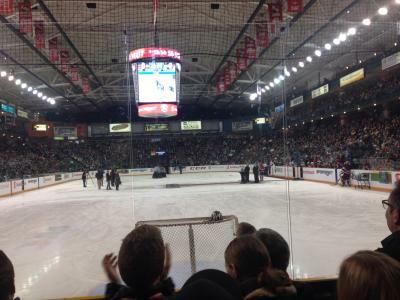 It was so amazing to feel the energy for hockey vibrating in an almost full house! On Saturday, Hockey Day in Canada was broadcast live from downtown Kamloops. I watched it from home but my husband went with jerseys and puck in hand so that he could get his childhood favorites to sign the memorabilia. TK and Sun Peaks partnered up to do summer and winter commecials which aired more then six times on Sportsnet throughout the broadcast. Joy Factory Films created the commericals and did a faboulous job showcasing Kamloops as the amazing community. All in all, Scotiabank Hockey day in Canada was a huge suceess and it really helped highlight Kamloops as a year round outdoor recreation destination.